15.33%. That's the coefficient of relatedness between Frankel and Chrysanthemum, the first mare scanned in foal to the champion racehorse during his first season at stud. As a point of comparison, first cousins are 12.5% related and half siblings are 25% related. Chrysanthemum, owned by the Coolmore team of Tabor, Magnier, and Smith, won a pair of group III races and ran third in the Pretty Polly (Ire-I). By Danehill Dancer out of a Sadler's Wells mare, she is bred on the reverse Sadler's Wells/Danehill cross of Frankel, creating 3x3 inbreeding to both of those influential sires. 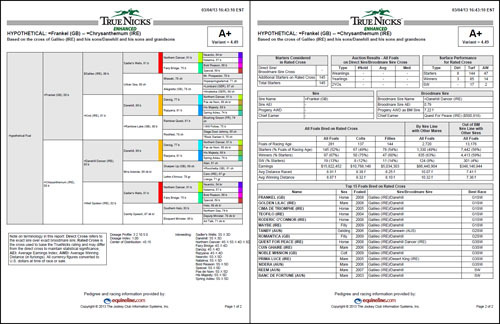 Heavy inbreeding is rare in modern Thoroughbreds, but 2008 champion 3-year-old Big Brown (TrueNicks,SRO) comes to mind as a recent top racehorse with a fair amount of inbreeding—his sire and dam were 10.35% related. With the amount of Sadler's Wells and Danehill blood present among top class mares in Europe, such inbreeding might become a theme for Frankel's stud career.